The team at Bluff Creek Dental works hard to give patients superior dental results. When damage to teeth is very severe, our Chanhassen dentists may recommend a root canal to alleviate the issue and get your dental health back on track. A Root canal (also known as endodontics) is a set of specialized dental treatments designed to treat problems that arise in the soft pulp, or nerve tissue within a tooth. Pulp tissue consists of blood vessels, connective tissue, and nerve cells. Ergo, when an infection or inflammation occurs there the experience can be very painful. In order to assuage this pain and the issue, a root canal becomes necessary, otherwise the problem will only worsen and could eventually cause dental abscess and systemic problems in other parts of the body. Do not worry, though. A root canal is no more uncomfortable than getting a common dental filling. In fact, this kind of dental treatment is actually one of the most effective ways of relieving certain kinds of tooth pain. What Causes Pulp Tissue Damage? 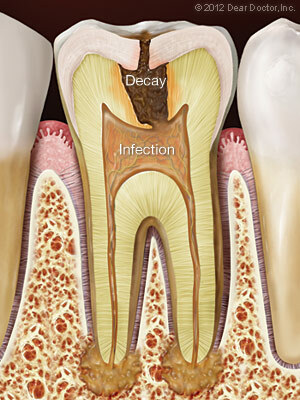 Untreated dental cavities allow bacteria to work their way to the center of the tooth, where they infect pulp tissue. Bacteria can also come into contact with pulp tissue through chipped or cracked teeth, or any openings in a tooth’s protective enamel coating. Additionally, trauma to teeth (like that which may occur in sports injuries or traffic accidents) can cause pulp tissue damage. Having multiple fillings or restorations on the same tooth increases the chances of this type of injury. And certain procedures like crown preparation or extensive orthodontics may eventually lead to root canal problems as well. Constant, severe pain and pressure in the mouth along with swelling and gum sensitivity indicate a need for immediate dental treatment. If you feel a sharp pain when biting down while eating, this is another sign of pulp tissue damage. And if you sense a lingering pain when eating cold or hot foods it can also be an indicator of a dental problem that requires immediate action. If you experience one or more of these symptoms, make an appointment with your local Chanhassen dentist as soon as possible. There is a false perception regarding root canals, the media tending to portray them in negative light. However, the truth is that root canals eliminate way more pain than they cause. 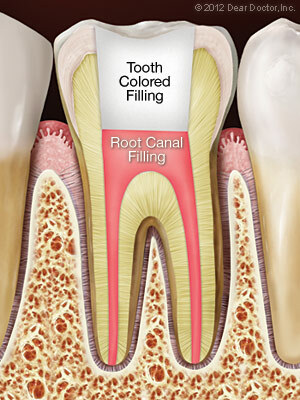 As mentioned, root canals can be compared comfort-wise to the experience of getting a common dental filling. And the completion of this treatment will relieve the much more critical pain you feel in your teeth due to infection or inflammation. 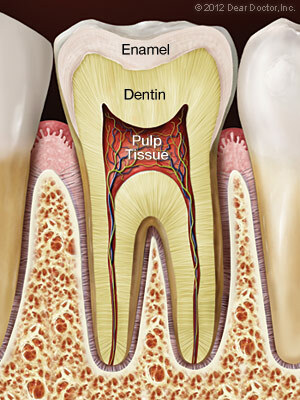 The root canal process begins by numbing the tooth, just like with a dental filling. In most cases this is the most uncomfortable part of the treatment, and it is over quickly. The next step is to make a small opening in the damaged tooth. Using tiny instruments, your Chanhassen dentist will remove dead and dying pulp tissue then clean, disinfect, and prepare the chamber and canals of your tooth for an inert, biocompatible filling. This opening is then sealed with adhesive cement. Your dentist may also recommend a dental crown or other restoration solution to further protect the damaged tooth. It is common for the tooth to feel sensitive and tender for a few days after your root canal dental treatment. Therefore, it is a good idea to avoid biting down hard on the treated tooth. Most post-treatment discomfort can be relieved with over-the-counter pain relievers such as ibuprofen. When you’re battling severe tooth pain, a root canal is the easy solution to end your discomfort. It’s an extremely common procedure that the professionals at Bluff Creek Dental are happy to inform you more about. If you would like to further your understanding of root canals, dental fillings, or the other cosmetic dentistry and traditional dentistry services we provide, contact us today. We look forward to helping strengthen your smile. For more information on root canals in the Chanhassen, MN area call Bluff Creek Dental at 952-679-6360 today!